Clicking on the Create button in the iOS Push Notifications panel at the top of the Actions Management page will take you to a form that lets you create a new, reusable push notification message action for iOS devices. The iOS Message Content form lets you define the content for your push notification message. Only the Alert field is required, all other fields are optional. The Message ID is a unique ID that is used to identify the message in the Message Localisation tool, you will need to provide your own ID when you create an iOS Action, or select an existing localized piece of text from the “Select a localization” drop down list. You can assign other localized versions of the text in the Manage Localizations tool and the message delivery system will ensure the correct version is sent to the player based on their last known device language and territory. The Message Text is the text that appears in the notification. This can be any unicode character including Emojis: 😁. The Badge field sets the number that appears on the game icon. A value of zero clears the badge. If no value is given, any existing badge value on the icon will be untouched. The Action Key changes the value that appears on the notification button to launch the game. The Sound must be a filename that matches a sound resource in the game build. If a file is found this sound is played instead of the default. The Image must be a filename that matches an image resource in the game build. If a file is found the image appears when the game is launched. 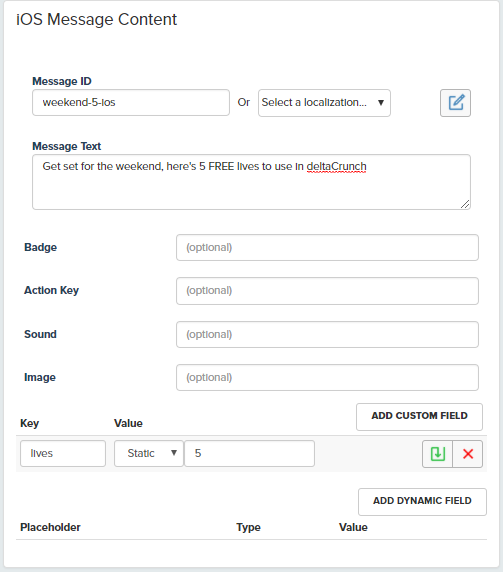 The Custom Fields allow you to add additional key value pairs into the notification payload. These parameters are often referred to as deeplinks and can be read by your game when it launches, they are often used to reward the player or direct them to specific content within the game. The fields appear as top level JSON keys in the notification object. More information on Apple’s notification payloads can be found here. Apple limit the total payload, which includes all the fields here to 2048 bytes. You can also add dynamic content to your iOS notifications. Clicking the “Add Dynamic Field” button will add a new dynamic field, you can add multiple. Please check that the characters you use are acceptable with any 3rd party content delivery channels. .
NB : Don’t forget to click the green Commit button on any custom fields you add before Saving your notification. Your newly saved action will be listed on the Action Management Screen. There are two buttons beside each action so you can Edit or Delete them.